Helix RADE 6.2 Preliminary Release #13 (5821) has been recalled, owing to the fact that it is over-aggressively rejecting post icons as being invalid. Europa Pioneers: look for an email containing more details. 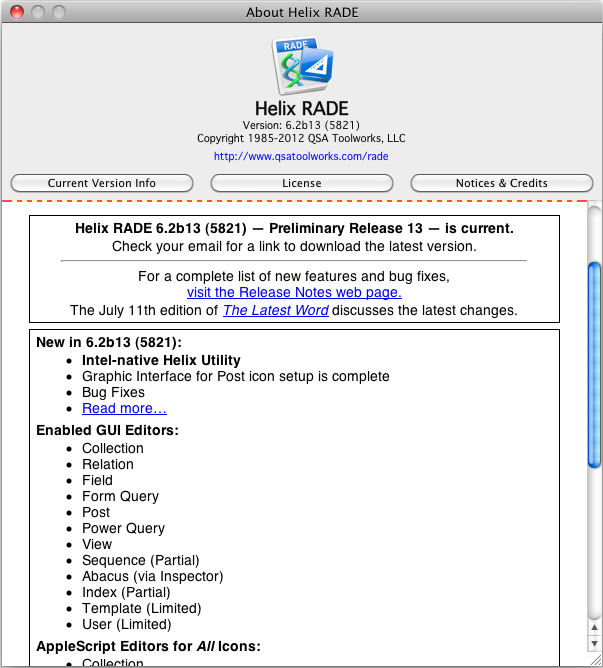 11 July 2012 — The good progress continues with the thirteenth Preliminary Release of Helix RADE 6.2 for macOS available today, a day late (not so bad) and a couple of dollars short (not so good). But we ‘sweeten the pot’ a bit by also including the first release of the all-new Intel-native Helix Utility. To those of you who renewed your monthly subscription to the Europa Pioneer Plan, a $20* charge will appear on your credit card today. (If you joined the monthly plan after June 10, 2012, the monthly charge is $40.) When we charge your card, we send an email containing a link to the latest update, so if you haven’t already gotten that email, please contact us right away. To those of you who renewed your annual subscription, look for an email an email containing a link to the latest update. You can also get it by logging in to our web store and checking your current licenses. If you haven’t received that email, perhaps you didn’t respond to our emails and calls asking you to renew for another year. If you didn’t renew or didn’t get the email, please contact us so we can investigate. For those out there who haven’t joined us yet, you can still join the monthly plan, for an initial payment of just $80.00, followed by monthly payments of $40.00. Or you can pay $440.00 and get every update we release until May 31, 2013. We’re still committed to monthly releases, so that’s 10 more updates delivered to you automatically. As always, the complete notes regarding what’s new in this release are found on the Preliminary Release 13 Release Notes page. To get the new Helix Utility, open the “Helix Diagnostics” folder in the disk image and drag Helix Utility (not ‘Helix Utility OS X’) into your applications folder, or wherever you have Helix RADE installed. One more note regarding updates: remember that your participation in the Europa Pioneer program entitles you to Interim Builds. As we work to deliver our “10th of the month” releases into your hands, we make each step along the way available for those who like to live on the ‘bleeding edge’ of Helix progress. Sometimes these releases bring dramatic improvements, but sometimes they contain bugs that require users to revert to the previous release. Sometimes — as was the case this last month — collections used with them are adversely affected and must be discarded. The Interim Builds are definitely and not for everybody, but if you don’t want to wait an entire month to see what we’re working on, check them out. And if you want to use them on a regular basis, contact Matt because he has a sensational little script that makes the process of downloading and installing the interim builds completely transparent. As always, this edition of The Latest Word contains an overview of the progress we’ve made, but before we turn our attention to this month’s bounty, we need to make an appeal to those of you who haven’t yet renewed your subscription to the Europa Pioneer Plan. In the last edition of The Latest Word, we pointed out that Helx RADE 6.2b12 — the June 2012 release — was permanently enabled. If you decided to not stay in the Europa Pioneer Plan for another year, you had a product that would not expire, as all the previous monthly releases had. But if you do drop out, it also means that when the product is eventually released, you will have to pay something more to get the final version. The amount you’ve put in — however much it is — becomes your discount on the price of finished Helix RADE 6.2, whenever it arrives. A little more than half of the program participants from the first year renewed their membership right away. While it was a bit disappointing that everybody didn’t renew immediately, we were reasonably sure that the rest of you weren’t giving up. Either you “missed the memo,” so to speak, or your renewal request got “lost in the mail,” or maybe you just were so beat by the heat that you just hadn’t gotten around to renewing yet. So we started contacting the Pioneers who had not yet responded. Through that effort, we’ve managed to cut that half down to about a quarter, and almost everyone we actually spoke to indicated that they wanted to renew but just hadn’t gotten around to it yet, as we had hoped. One member indicated that budget cutbacks have forced him out of the program, but asked us to keep in touch with him when we’re finally done; another had actually passed away the day before we sent our first renewal request. (Please don’t let that happen to you!) But everyone else has given us their enthusiastic support and authorization to go ahead. All of this is to say that even if we haven’t spoken with you yet, there is still time to renew. If you were a member of Europa’s first year and haven’t heard from us, it’s probably because the contact information in our database is obsolete, or because your spam filter is shielding you from our entreaties. Either way, please contact us by phone or by email: we need you and we want you back. As for the rest of you, the ones who are still dug in and waiting for this to be over, this is the time to join up. The entry price is higher than it was when the program began, but take a look at how well Helix has served you in all these months and years since you last had to spend anything on it. Don’t wait, as many do, for your Classic-capable Mac to die and start scrambling to find a new one. We’ve been hard at work making sure that Helix will run on the latest Macs with the latest Mac OS. Your Helix collection can continue to serve you well into the future, but you’re only going to see that if you pitch in. Even if you’re happily tooling around macOS using the very reliable Helix Engine as your pilot, think about getting on board the Europa Pioneer Plan. Helix RADE 6.2 does everything the Helix Engine does, and then some! The biggest improvement is that it remembers print orientations so you don’t always have to remember to go to Page Setup for reductions, enlargements, landscape printing, multiple copies, duplex printing, etc., but there are other improvements as well. And then there is Design Mode — which is no small thing — that will continue making steady progress toward completion every month, with your help. The software business can often be a very cold place, especially in terms of customer feedback. If you’re in this business to get a pat on the back, you almost have to reach around and do it yourself. Users rarely call to tell you how good your product is, no matter how true that may be. We really do want to help, of course, so the first thing we generally have to do is to calm the user down and ask whether or not their Helix collection passes the utilities. By this, we mean Helix Utility and Update Collection, the two diagnostic and repair programs that have been packaged with Helix for generations. We have always dreaded asking that question because the reply from many callers is “What do you mean, utilties?” That can be disheartening on both ends of the call. For these users, Update Collection is something they used once, long ago, to, you know, update their collection to a new version of Helix. And Helix Utility was always a mystery: “I double clicked that once, but nothing happened,” is the typical response. In very broad stroke, the two applications are designed to assure the data (Helix Utility) and structure (Update Collection) of your Helix applications are in sound shape. Think of one as doing maintenance on your car, and the other as keeping your insurance paid in full. Fortunately, most Helix users have adopted the habit of using these tools faithfully. But can you ever be too safe? We think not. Both Helix Utility and Update Collection have been macOS native since we released the first macOS native Helix Server, way back in December 2005, and they have been doing their respective jobs quite well ever since. But then Apple switched over to Intel chips and, eventually, support for the PowerPC-based programs (through a bit of magic called Rosetta) ended. With the release of Mac OS 10.7, aka Lion, our two utilities could not play in that part of the jungle. Intrepid Helix Users — who have been out there with the Lions, so to speak — are well aware of this problem. These Helix users run Helix Server on the latest hardware as a matter of course. But with Lion, they discovered that they couldn’t run the utilities there. Some grumblingly continued running Helix Server on an older macOS 10.6 Mac, while others adopted a somewhat convoluted routine of compressing their collection, walking it back to an older machine that can run the Helix 6.0 utilities, checking the collection there, and then putting it back on their Lion machine until it is time for another utility run. As it happened, Lion came out at about the same time that we started seriously working on Europa RADE, and although we knew we needed to rewrite the utilities for the Intel platform, we wanted to make some RADE progress first. Then we had a brainstorm: why not build the updating and structure checking functions — those done by Update Collection — right into RADE itself? That would solve multiple problems: it would run automatically whenever the user opened a collection, it would make updating into a virtually transparent operation, and it would mean one less program for us to maintain in the future. And so, as the Europa Pioneers know, Helix RADE 6.2 checks its own structure, warning of trouble almost before it happens. It gives you a way to ‘back away slowly’ when errors are detected, and it even provides specific information about the error to help you track it down and fix it yourself. We’re very proud of this advance, and will be even more delighted when Helix Engine and Server gain this capability. With that done, we no longer have to think about Update Collection — it’s now part of history — but what about Helix Utility? One thought was to build those functions directly into RADE as well, but then we realized the impracticality of that. Helix Utility acts as a ‘fact checker’ for Helix. It has its own code independent from the ‘big four’ (RADE, Engine, Server, Client) and integrating it would leave us without the independent double check it provides. No, Helix Utility couldn’t be integrated, and therefore it would have to wait. Pay no attention to those men behind the curtains! Being immersed head, hands and feet in RADE for the last year and a half, we have labored to keep the distractions out of sight, and Helix Utility was no exception. We paid it a great deal of lip service, because of its inevitability, but we didn’t do too much about it. But last month, Apple announced that Mountain Lion (macOS 10.8) was coming in July, and we knew that we could wait no longer. If we didn’t have an Intel-native Helix Utility, we would be two systems behind the curve, and with the thought of that bringing up too many memories of the ‘bad old days’ when Helix users scrambled to keep old machines running as a matter of course, we set RADE aside for a while and devoted our full attention to this long-neglected sidekick. And now, at last, it is here. The first release Helix Utility 6.2 is available today. To those of you who have been living with Lion can sleep a bit easier tonight. And you can use it to check collections running in any version of Helix from 4.5 through 6.2 even if you can’t upgrade yet for some reason. But wait, there’s more! Having gathered literally years of feedback on Helix Utility — listening to people struggle to understand it, or complain about it requiring multiple steps to accomplish simple tasks — we took stock of the situation and chose to give it something it never had before: an honest-to-goodness user interface. Take a look at the image to the right. Yes that’s Helix Utility! Now, when you launch it, instead of sitting there waiting for you to somehow know that your next step is to go to the menu bar, it presents the complete interface in a single window. On the right is a set of tabs, with each function of Helix Utility given its own panel. The default tab is First Aid, which is what Helix Utility is used for 99% of the time. The three buttons replace the old Tools menu, but in a cleaner, safer way. In the old Helix Utility, you had to remember to turn off the options in the Fix menu before running Data Damage Check or you could end up with a ‘half-repaired’ collection. And you had to remember to turn them back on or Data Damage Repair would do nothing at all. For this first release, we have turned on just the Verify and Repair buttons. We tested those thoroughly and are confident they are ready for use. The rest of the functions of Helix Utility are seldom used, and instead of holding it up while we complete the work on those, we thought you’d like to be able to start checking your collections now on your Macs running Lion, and soon, Mountain Lion. Because this new Helix Utility is officially version 6.2, we are making it available to Europa Pioneers only. If you are using Helix on an Intel Mac and you’re not a Europa Pioneer, you owe it to yourself to join up now. Between the built-in structure checker and the new Helix Utility, the maintenance and insurance Helix users rely on are back. And, as always, you’ll be helping us fight the good fight to get this thing done. Another thing we promised for July 10th is the completion of the posting icon. And it is so. This capability completes the posting icon. This means that in the Helix graphic user interface, you can now click your way through the entire process of setting up a posting icon using the Inspector, doing everything from specifying the target relation and links to setting up the posting triplets. If you have never used the posting icon before, or rarely used it at all, posting may be something of a foreign concept. Over the years, we have always been surprised to learn how many Helix users have actually never used posting in their applications. Generally, we have chalked that up to the steep learning curve associated with the original posting icon interface. A study of the history of posting in Helix reveals a great deal of retooling of that interface prior to its intial release. While it may be second nature to those who use it, of all Helix’s graphic user interface components, posting (and perhaps the old power query interface) should probably, to paraphrase the old joke, be in the dictionary under “camel,” an animal designed by a committee. There’s just too much going on in that icon to be presented in an intuitive manner. This latest implementation continues the trend of unifying, simplifying and generally making the Helix graphic user interface more consistent. If you have been playing along at home, and you’ve already learned how to use the new subform setup dialog, how to use this one should be immediately obvious. If you are, like us, hooked on posting, you’ll be happy to see this last piece of the macOS posting interface. It banishes once and for all the old, nonintuitive posting icon interface and allows you to use the Inspector to do the entire job in a much simpler, more logical and intuitive way. Despite the bright news above, there is a little cloud in this month’s blue skies, albeit one most of you will never encounter. But they say every cloud has a silver lining, and the sliver lining behind this particular cloud is the realization that macOS has changed the playing field on us in yet another subtle way. First, the bug: we call this critter the HTAB/3000 bug. 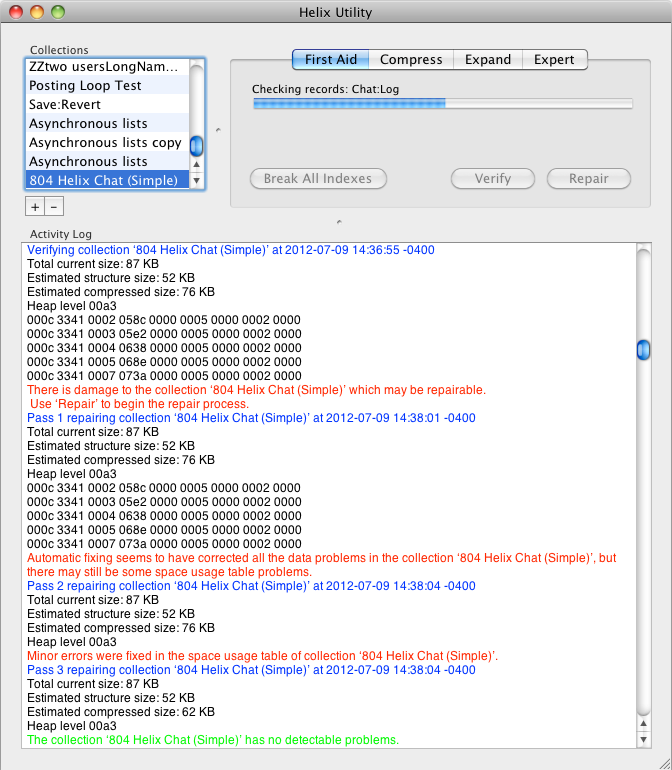 It affects any collection created in Helix RADE 6.2, from the first release until today, where it was finally fixed. 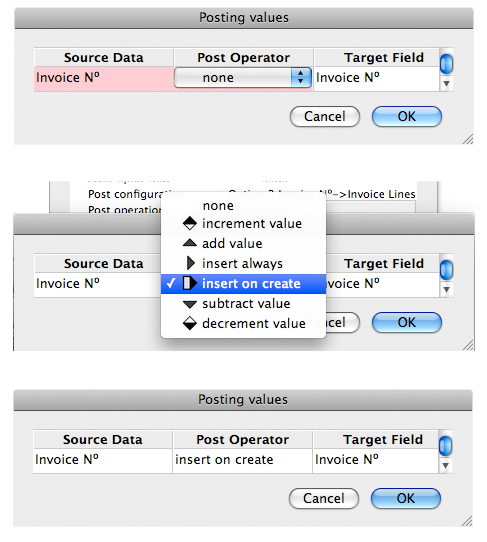 It took this long to discover because it only happens in collections that were created from scratch in RADE 6.2. HTAB/3000 is short for “Helix TABle” and table 3000 controls two aspects of a collection: its sort order and its character equivalencies. This table is built when a collection is first created and never changes. The table tracks the correct sort order for each character and which characters are equal to each other. The HTAB/3000 is how Helix knows that “Ed” should appear before “Fred” in a list and that “Ed = ed” when you are doing a query on that data. And for the sake of non-English users, it also tracks — based on the language of the system on which the collection was created — how diacriticals should be sorted and treated in comparisons. The bug we discovered was that when a new collection was created in Helix 6.2, the HTAB/3000 for that collection was constructed using “case and diacritical sensitive” rules, meaning that for everything from a quick query to the locate tile, ed ≠ Ed. The sort order was similarly confused. The good news is that collections that were created in Helix RADE 6.1 or earlier are immune to this problem. Since very few of us are, at this point, creating new collections in anything other than an experimental mode, this is mostly a non-issue. But if you have created a new collection in Helix RADE 6.2 and you don’t want to have to start over, contact our tech support department and Matt will guide you through the easy fix. But this leads us to the second, larger issue, which is where things get messy. When a collection is created, the data that goes into HTAB/3000 is taken from the operating system, and the answers that macOS give us are not the same as the answers given by Mac OS Classic. So even with the bug fixed, a “Helix 6.2” collection will sort and match somewhat differently than a pre-existing collection. But the differences are subtle and we don’t want to turn this into a technical forum, so if you want an in-depth explanation of the differences, see this technote where we describe situation in excruciating detail. With Helix Utility up and running, and the post icon complete, we are going to spend most of the next month working on bug fixes. We’ve already done a few, which you can read about in the release notes for Preliminary Release 13, but we plan on tackling a whole bunch more before turning our attention to the next big push. That ‘next push’ will be in the form of a new graphic user interface component for Helix; one that will allow us to deliver the rest of the icon editors. We also hope to complete the index editor, but mostly we will be doing a bit more infrastructure work in preparation for some big advances in September and beyond. Once that foundation is done, only three editors will remain: the template, the abacus, and the user. When those are done, you will be able to do everything in Helix RADE, without having to go to Classic or use AppleScript. On that day we can unleash a huge collective sigh of relief. There will still, however, be one element that will keep Helix from doing absolutely everything it did before: View by Icon. Since our last report, more of you have expressed interest in supporting the View by Icon project. In spite of the rising level of interest, the committed funding is not yet at a level that will justify changing course. Don’t abandon hope, ye icon slingers. Helix ultimately isn’t Helix without View by Icon. We know that. We will not abandon this key aspect of Design Mode; but we must get these three other pieces in place first. Progress also continues on Client/Server 6.2 as well. We’ve had a stubborn problem related to running the built-in structure checker on a live Helix network, but we think we may have it on the run at last. Until then, we will keep building them right along with our RADE advances. Stay tuned on these items. Our thanks to the many users who have renewed their Europa Program memberships. Our deep appreciation also goes to the many as yet anonymous readers of this message who are still running Helix on some rickety configuration not long for this world. We know you will call sooner or later. Please make it sooner. We want all of you back. Great progress can only continue with great support.